The construction and renovation of airport terminals and flight operations facilities worldwide represents a large portion of the capital being spent on infrastructure projects today. IPA’s assessment of capital projects at several airports globally shows a significant opportunity to enhance capital effectiveness in this infrastructure sector. Some of these airport projects are large projects involving the construction of new passenger terminals and operations infrastructure, like aircraft hangers. Other projects are smaller in cost but still important, such as baggage claim areas or shopping corridor renovations. Whether funded by government grants, private funds, or Public Private Partnerships (PPPs), airport projects not only sustain commerce at and near the airport, they can also usher in regional economic growth. But for those involved in the planning and execution of airport projects, there are risks. Airport projects are often subject to public and media scrutiny, especially when they exceed cost and schedule targets and do not perform as planned. IPA’s recent work on airport projects shows a lot of room for cost effectiveness improvements with respect to their planning, development, and execution. In particular, like the other types of capital projects IPA has been evaluating in the past few years, project cost overestimation is a major source of inefficiency and economic loss. Overestimating may sound like a “safe bet” to some, but recent IPA research indicates that capital project systems delivering constant cost underruns are cheating stakeholders who expect maximum value from the capital spent. Project managers have the tendency to approve late changes and extra contractor hours when they know that a cost target is padded to avoid an overrun. Rather than overestimate a project’s cost, project managers should aim to deliver projects close to an industry average cost. IPA has taken a closer look at what factors are driving the latest cost overestimation trend. 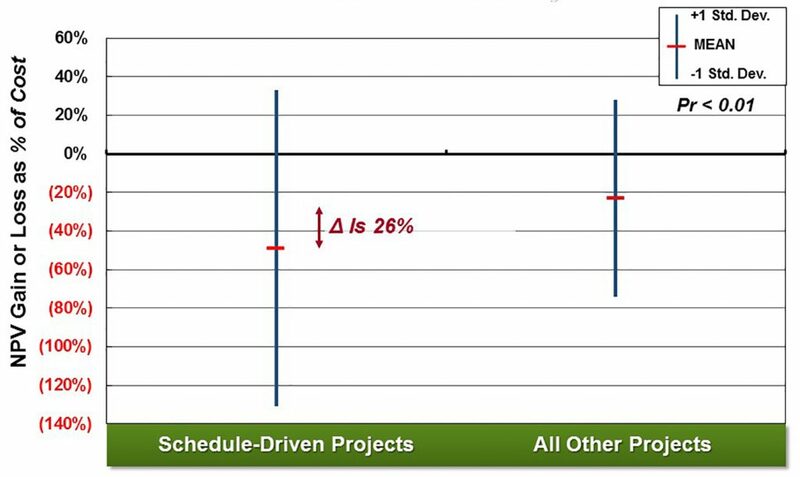 One project characteristic that stands out is that schedule-driven projects are prone to cost overestimation (Figure 1). Airport projects are regularly schedule driven, given that other service providers and vendors depend on these projects to be done on time in accordance with commercial agreements. Schedule slip can derail third-party business plans, resulting in losses for retailers and car park management groups, for instance. Late projects can also disrupt airlines’ plans for new flight routes and other operations. Airport project managers may also be inclined to overestimate how much a project will cost to complete to avoid angering business and having cost and schedule overruns reported in the press. Heavy reliance on contractors is another factor driving cost overestimation at airports, notably when the estimate is developed by a contractor. Infrastructure projects are often executed using design-build contracts, meaning that the estimate is based on what the contractor provides. A design-build contract approach may be suitable when a projects group lacks the in-house capabilities to define the scope and develop a cost and schedule. This appears to be true at many airports. The downside for airport project managers, however, is that they have to make a financial commitment to engage a contractor before sufficient definition work has been done. This financial commitment is a “de facto” authorization of funds that leads to an overlap of funding for project definition and detailed engineering work. Businesses have grown accustomed to de facto authorizations to secure funding for projects right away, but value is lost frequently from authorizing significantly more money than is required to complete a project. An increased number of airports located globally have approached IPA to assess their project systems to correct system weaknesses like project cost overestimation. Evaluations of individual airport projects generally show opportunities for increased capital efficiencies. By looking at a set of projects executed by an organization, from a very minor sustaining project to a large growth project, IPA can help an organization understand how practices implemented during the front-end phases of project development affect cost outcomes. IPA research shows that clear objectives and a strong team provide the foundation for delivering successful projects. Solid front-end definition work ensures cost and schedule predictability and effectiveness, and, of course, a project that functions as planned. Recognizing the constraints of the airport industry, IPA has found that basic definition practices are not applied, and a lot of the risk is passed on to the contractors. For example, ensuring that all functions are represented on the project team (an integrated team) is significantly linked to better outcomes. This is of particular importance for airports because many stakeholders are involved, even for small projects. When key functions, such as the airport’s operations manager, are not engaged until the later phases of a project’s design and execution, late changes necessary for operations to run smoothly become very costly. Airport capital portfolios are substantial, even in smaller airports, so there is plenty of opportunity for cost savings. These savings can be used for additional projects or for boosting resources. IPA can evaluate the project system, identify the gaps, and provide recommendations. This performance baseline provides insight into helping the project organization implement changes that can improve outcomes. By reducing the weaknesses in project practices, the overestimation problem can be resolved and the project system can set more competitive targets. The focus for projects can still be predictable outcomes, but there is opportunity to do so at a lower cost. Visit the Infrastructure business area page to learn more about how IPA can work with your organization to improve the capital effectiveness of your infrastructure project.